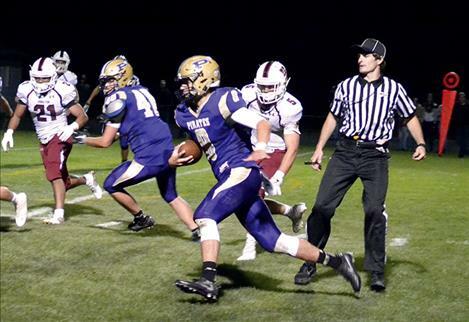 POLSON — The Polson Pirates stomped the Columbia Falls Wildcats at home Friday night, 42-27. Columbia Falls was leading at the half, but Polson outscored the Wildcats 28-17 in the third quarter and held them scoreless in the fourth to clinch the win. The first touchdown of the game saw Tanner Wilson connect with Cadis Chowing for a 36-yard pass. Wilson went 14-26 for 293 yards and three touchdowns. Wide Receiver Matthew Rensvold had a productive night with 12 catches for 248 yards, two touchdowns, one sack and nine tackles. Linebacker Cameron Brown’s picksix interception ended in a touchdown in the 3rd quarter. Cadis Chowning and Koby Garcia reigned in eight tackles each to round out the defensive effort. Polson is currently 6-1 overall and 3-0 in conference, sitting on top of all Northwestern A teams. The Pirates travel to Havre on Friday for their last regular season game. Playoffs begin Oct 29. ST. IGNATIUS — The Mission Bulldogs gave a valiant effort despite their 46-0 loss to 6B conference leaders Loyola Sacred Heart on Friday night. Gus Bosley rushed for 101 yards on 13 carries. On defense, Benton Adams led the team with 11 tackles, Miles Anderson had eight tackles and Wacey McClure earned six against unbeaten Loyola. This Friday the Bulldogs make a short drive to Ronan to face conference rivals Chiefs at 7 p.m.